1) Candie is the bunny. 2) It is actually all about the bunny. 3) The Blue Rose group + Mjr Briggs are the best-developed characters in the show. 4) This is legitimately Twin Peaks, no matter what negativity anyone decides to introduce into the proceedings. 5) This return of Twin Peaks is far from "perfect" (whatever the hell that means), I'll give you that. But that is the definition of experimental art. Much of this is not even "experimental" (Part 8 isn't actually "experimental" at all. It's very deliberately structured, and there are several precedents in art, from Penderecki to Kubrick to Lynch himself, and onward), but what is experimental (the form of the series as a whole) is guaranteed not to be perfect; because any experimental thing is, by definition, imperfect. If you're expecting a perfectly-paced TV show, then yes, go watch Game of Thrones (or House of Cards, American Horror Story, whatever), with no judgment from me as to your level of intelligence or perceptiveness at all. But don't complain to me about Twin Peaks: The Return in relation to anything currently on the air. It's apples and oranges. 6) Oh dear, I got too serious again. I love you all and hope for no strife from this...whatever the hell I'm just now posting. 3. The Red Room is an inter-dimensional insurance fraud solving entity. 4. It is about the rabbit. Gordon is a psychiatric patient who thinks he's Deputy Director of the FBI. Tammy and Gordon are his carers and they play along just to stop him going berserk and smashing things. The plane is not a real plane, it's just a simulator. It's his favourite thing to do most days. He does genuinely have a hearing problem though, so please don't make fun of him for that. Harry S. Truman is not ill. He is doing an undercover investigation. Every time Frank speaks with him on the phone it's all code. "Harry, beat this thing," means "the owls are not what they seem". Wally Brando was killed while riding on the back of James's motorbike when James had his accident. Frank Truman hired an actor to play Lucy's son so she could pretend he's still alive. David Hasselhoff will make a surprise guest appearance, probably in some kind of heroic role rescuing somebody from drowning or something. Dale Cooper is an anagram of Real Dope Co. This could be a clue that he is somehow involved with Jerry Horne's cannabis business. I've never seen Marmite being eaten in Twin Peaks. Seems suspicious to me. Martmite backwards is Etimarm. Could be an old Native American word for owl cave or something like that. Definitey worth investigating. I've never seen any pet cats in Twin Peaks either. Perhaps this means the residents of Twin Peaks eat cats? I've never seen it on RR Diner menu, though. Perhaps it is called something else to disguise it. Cherry Pie perhaps? by the way, Cherry Pie backwards is Eip Yrrech, which looks like it could be Welsh or German or Slovakian or Polish, I don't know. I'm not too good with languages. I just prevent* the information, it your responsibility to understand what it means. Kind of like David Icke. "Sarah Palmer Drinks Too Much of the Alcohol" is an anagram of "Aloha, Dale Cooper's Tank of Moths Lurch Hirm". Now, this is really interesting. Firstly, "aloha" is a Hawaiian greeting, and we know Dr Jacoby was from Hawaii. Hirm is a town in Austria, so there may be some connection there, especiallly if Eip Yrrech is the name of the town's mayor. 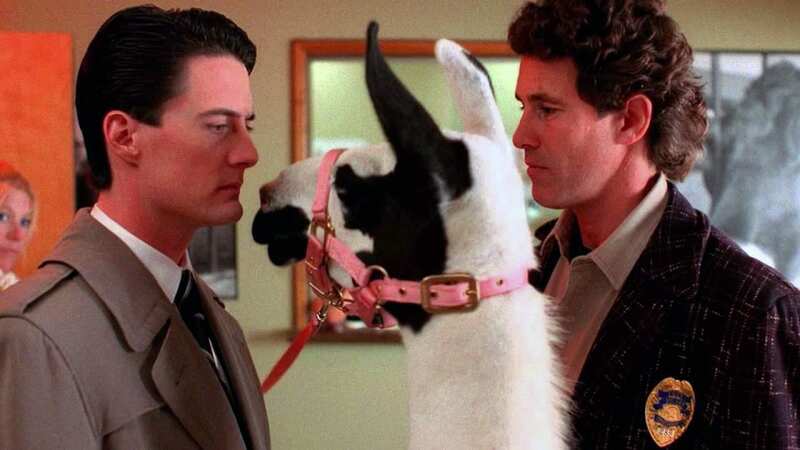 As for why Dale Cooper has a tank of moths, I'm not sure, but it will probably all become clear as we reach the end of the season. *Genuine typo. Meant to write "present", but I have left it as "prevent" because it's funny. I have a theory the woodsman turned James song on the radio in the police car and thats what blew Bill Hastings head up! All Coop needs to wake up is a pair of bunny slippers. Here's hoping Janey-E buys him some, and soon. Gamonzobia is in the same family as Surstromming. You need to golden coats to shovel out of shite. Lara Flynn Boyle and David Lynch don't play squash together. If you're an inter-dimensional murderer, don't hide evidence in toilet doors. Flush it. "Gamonzobia is in the same family as Surstromming." But not quite as disgusting. That distinction belongs to Balut. Eeesh, yeah, that stuff is pure YUCK and 'WHY'? "Mummy, these eggs are bad." "OK... but I'm leaving the beaks." The bucket of llama's was foreshadowed in season 1. Indeed. Llamas are not to be trusted. Especially when vodka is involved.